Prioritising self care is hard. the reality is, most mamas, feel there is no time, they always have a million and one things to do and are juggling so many roles in any given day, there head is often spinning. Now, more than ever, the way are world is, the multifaceted nature of things and the constant virtual and visual connectivity, means it’s really hard to not do stuff, to prioritise yourself, to slow down and meet your own, self care needs. So I hear you, I relate whole heartedly and I acknowledge all you do as a mama. There is no denying that the energetic expenditure thats required to care and nurture a new born, a baby, or a toddler is immense. Our culture is obsessed with doing and productivity so when you are catapulted into the world of motherhood, it can feel like a virtual impossibility to do the exact opposite. To gravitate away from ‘doing’ and that which we are praised and validated for in the world of work, and daily living. As mamas and especially in the first 40 days post birth we need to slow down. We actually need to try and do less, yet I know the reality of this is really hard. I struggle with it as a mama of two, its hard to do less. But acknowledging the need is the start, then creating easy ways to achieve it. So thats where I come in, or rather I want to share my own daily self care checklist which I made for myself as a mama of two. Which I try to uphold to ensure I feel good, I feel nourished and loved first and foremost by myself. I recognise that then I have the energy to love and nurture others. The body is roughly 75% water. Most of our imbalances in the body are a result of dehydration. In pregnancy and especially in the post natal period hydration is vital. Post birth Onward and particularly if breast feeding, keeping fluid intake up is key to supporting the body through the dynamic changes which are happening. Water is part of the 5 element theory in Chinese medicine and mainly corresponds to the kidney organ system. In essence your kidneys are responsible@for cellular hydration - the movement of water to and from your cells..
Post natally this is key as without sufficient hydration the body struggles to process toxins, can lead to inflammation, hormonal imbalance, headaches, fatigue, and other health imbalances. Most notably the kidney system, specifically the adrenals are in short responsible for handling stress. The adrenals produce excessive amounts of hormones when we are stressed. In short stress can lead to dehydration. So many factors which will impact women in the post natal period. 1. Drink first thing ideally 30mins before food to ensure complete hydration. Water before food also helps to hydrate your stomach lining supporting production of digestive enzymes & absorption of nutrients from your food. 2. Small sips - too much in 1 go can effectively shock and therefore ‘dilute’ your kidney system. A larger amount slipped slowly in the morning and then small amounts through the day. 3. Manage your stress levels: Meditation, yin activity, acupuncture all help to calm and support healthy kidney function. 4. Support kidney health: Ashwagandha helps to decrease the overstimulation of the adrenals and stress hormones. Checkout my favorite mama’s smoothie recipe here, and read more about my 3 favourite superfood supplements for mama’s to support hormonal balance, boost energy and promote restful sleep. 5. Juicy fruit: Fresh fruit contains a variety of minerals and electrolytes that support cellular hydration.. Ensure you drink enough fluid, herbal teas, hot water & lemon, water - daily recommendation varies but in the post natal period aim for 8 glasses of water. In winter and the early post natal period - warm is better . For a woman and a mama movement is essential...self care is an absolute must. I increasingly observe & witness that mamas NEED this particularly in the later months and years after babies not just in that immediate 4 trimester period. As a woman it requires us to listen very acutely to what are inner landscape is describing to us. It requires that we tune in and respond to those needs that we speak back to our body with the language it understands, and that is the breath.. It is that beautifully simple and uniquely profound. It mirrors all the things we ultimately need in pregnancy and all the things that will guide us gently and consciously in birth. So find something that resonates with you. Find a teacher who speaks your language and invest some time in your own self-care so you have the physical, emotional and spiritual vitality to share that love. If you want to do some home practice, check out my tips for safe post birth practice here, and look out for my nurture and stabilise sequences which will be on the blog soon. Food is like natural medicine for the body. It can heal and restore you to your truest and most vital self. The process of growing and birthing a baby uses up an immense amount of energy, and in particular yin energy due to the natural blood loss during the birth process. We need serious nourishing to enable our body to restore. Healing Foods - Soft, soupy foods are favoured around the world to honour and support the body during the post-partum period (post birth), when there is illness, injury or trauma. A new mother needs warm, soft foods and certain herbs to support a digestive system which is slower post birth, to promote internal healing and cell tissue repair in the body and for mental and emotional well being. Putting nutrition first, making space and asking loved ones to help in creating and stocking your freezer with homemade, healthy, soul food, helps to support internal healing, cell tissue repair in the body and promotes mental and emotional well being. The right food, spices and herbs will help boost metabolism, enrich breastmilk for healthy brain development, stoke your digestive fire, helping to stimulate circulation, blood flow and therefore energy and vitality. Ensuring this approach to food will also help to promote more restful sleep when you do get it… and that is music to any parent’s ears. WARMING FOODS – Eating a diet of Warming, soft foods and avoiding or limiting cold, uncooked foods will help to support healing. cold foods shock an already sluggish digestive system and use up vital energy to warm the body. Eating warm foods takes less energy to digest and absorb nutrients, it heats your body, meaning more of the bodies energy is available for healing and restoring. Try to incorporate warming spices; ginger, fennel, cumin, turmeric, cinnamon. Herbal teas are also great and Golden Tumeric Tea is an absolute must! SOFT FOODS – around the world traditionally post birth foods are soft, soupy and warm. Think like baby food. Birth is an immense physical, emotional and energetic feat. Added to that your digestive organs have been compressed for the latter part of your pregnancy and so are slower and weaker post birth. Soft foods ensure the body isn’t expending its depleted energy to stoke a sluggish digestive system and boost metabolism. Try: Soups, stews, broths (bone broth or mushroom broth), cooked grains. FRIENDLY FATS: Fish oils, animal and plant fats are essential in the post natal period to help you thrive amd are essential for supporting the development of your babies nervous system. This will give you energy to restore and boost circulation and metabolism and balance hormones so all round helping you to stay healthy in body and mind. Think: oily fish, avocados, cocnut, olive and seaseme oil, grass raised meat and butter. We need to prioritise rest as mamas not just in the immediate post birth period. Birth can leave a woman feeling highly susceptible to emotional and physical strain. Your body is doing immense work post birth. To conserve and build chi in the body (vital energy), rest and nourishment is essential. I sort of feel like no explanation is needed here....But then in the same sentence know that it is. Rest is sadly overlooked in our society yet around the world this is common practice. A mama is supported in all ways so she can rest post birth and find a sense of equilibrium in body, mind and spirit after the hugely transformative and intense act of birthing a baby. Rest and replenish so that she can use what energy she does have to nurture and fall in love with her baby.. Many cultures still respect the sanctity of birth the monumental shift that is occurring not just physically but spiritually, emotionally and mentally - in both ayuverdic and Chinese medicine this time in a woman’s life is considered crucial in ensuring her long term health. The first 40 days post birth is so highly significant in determining a woman’s health in the future. Equally rest is needed after that fourth trimester. This is were for many women it can get even tricker. As they take on more, return to work or have more children. This is when we need it most. In a busy world this is where that gloriously simple but arguably most challenging posture in yoga can be a mamas greatest friend.. shavasana - seen by some as a ‘nap’ at the end of class, challenges us to be awake and completely relaxed which may for some be both unfamiliar and difficult to achieve. But this pose has insane health benefits when practiced regularly; calms the nervous system, relieves high blood pressure, headaches, fatigue, anxiety, insomnia and helps release muscle tension... hallelujah what is not to love. We now also know that your brain is actually growing during the post natal phase. Scientific research is showing that certain regions of the brain are expanding, now with those skin cells repairing and the liver detoxifying, your body needs rest to achieve this. So 10 min shavasana nap anyone? We need love, hugs and physical support as humans and particularly mamas during the immense period of change which happens post birth. I think this is apparent now more than ever. We are so richly connected virtually but this is not a substitute for real time interaction and connection. A hug speaks volumes to our soul and our spirit... it feels good, it helps reduce cortisol levels aka stress in the body. it helps cultivate a sense of patience, acknowledgement and acceptance of others and of ourselves. It fosters a deeper connection with our mind and our body building our self awareness and proprioception. Oxytocin, the hormone of love, is induced in the body when we have a meaningful and loving connection. Widely known in the birth world and growing interest in a wider context, Its a juicy topic right now. With scientific studies from ethology (study of behaviour) to epidemiology (studying the long term consequences of experiences at the start of our lives), showing just how important this hormone is. This hormone is indeed what impacts most influentially in maternal behaviour and emotions. Released with a cocktail of complexly balanced hormones, it fortifies bonds between loved ones and is powerful enough to do the same with total strangers. Personal connection and loving touch from a massage is a great way to assist recovery, promote vitality and boost circulation. Belly wrapping and ‘closing the bones’ a ceremony in Mexican tradition includes for the mama; massage, herbal steaming and binding, intricately wrapping the body to support the tremendous post natal changes. As women and mamas we need the presence and companionship of a soulful sisterhood, a tribe of women of different stages of life who can share their wisdom and experience, comfort, encourage and listen to a new mama. And I mean really listen, without need to impose. Your heart and your nerves are highly sensitive as a mother and we need to presence of other women to support our emotional state. So connect, have a hug, a chat and a giggle with someone. Getting outdoors, in nature and breathing in fresh air is like therapy for body, mind and soul. 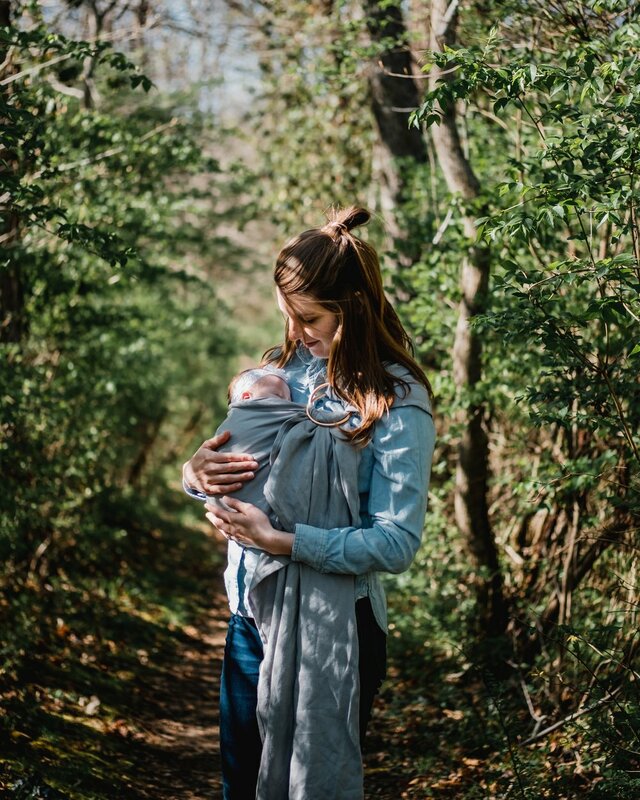 For a new mama getting outdoors isn’t always a reality or physically possible. But having a connection with nature is, the power of simply opening a window, closing your eyes and deeply inhaling to smell some fresh flowers, bringing a little outdoor into your home with house plants, or choosing a comfortable feeding spot by a window with a view. This simple acts all help us to connect to that slower pace, to honour the awesome wisdom we can learn from the natural world around us. Our connection with nature helps us to cultivate self acceptance, patience and love at its essence as we observe that in nature no process of development and growth can be rushed, it takes its own time. As mothers we need to adopt that same loving kindness to ourselves. Taking a bath with herbal salts or turning off your phone and taking a walk or seat outside. We draw a deeper breath when we are in the open air, which acts to calm the nervous system, the mind, slows our heart rate, and reduces levels of cortisol in the blood therefore relieving stress. This not only feels good, it also helps to cultivate a deeper connection with ourselves, our bodies and babies and our natural environment. So be good to yourself mama, prioritise your own self-care by honouring your basic needs. Im really excited to share a project Ive been working on and which is available to purchase on the website. This project was birthed out of love for the mamas, a need to ensure my own self care and health as a new mama of two. Check out my instagram feed for a sneak peek and get in touch if you would like to order your very own pack.